Jubilee Hall Trust’s FLAME Awards finalist invited to Parliament! 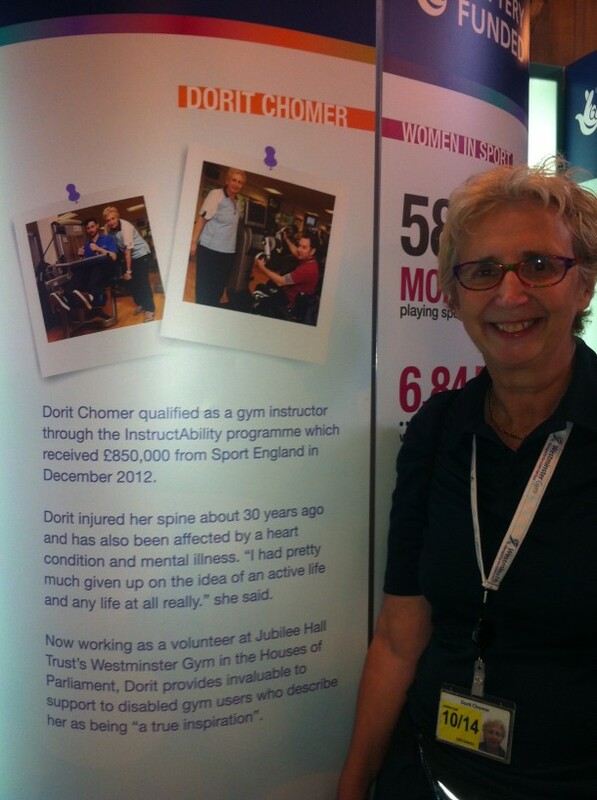 Dorit Chomer, a disabled volunteer fitness instructor working at Jubilee Hall Trust’s Westminster Gym, was a finalist in this years FLAME awards which were held at the Telford International Centre on 2nd July. Dorit was nominated in the Spirit of FLAME ‘unsung hero’ category, and was one of only four finalists out of over 300 people nominated! Although she didn’t win, she was highly commended by the judges and thoroughly enjoyed the experience, describing it as ‘the best night of my life’! Dorit’s story has been used by Sport England as a case study, showing how disabled people can be re-trained (Dorit was formerly a lawyer) to take on a second career. The Sport England exhibition ran in Parliament from 30th June to 4th July, and Dorit was invited along to meet her local MP.